A most impressive and individual detached family home designed by Emily Warwick of Warwick Stewart Architects. Much thought has gone into the layout, design and orientation of this home and viewing is thoroughly recommended to fully appreciate all that it offers. It also benefits from there being no onward chain involved for those purchasers looking for a quick completion. Located on Irwinstown Lane, which is just off the Station Road at Upper Ballinderry, this home offers the best of both worlds for prospective purchasers, tranquil country living combined with an excellent central and convenient location. The home is just minutes from the A26/ airport road, one of the main arterial routes in Northern Ireland, which leads directly to the M1 motorway at Moira and Belfast International Airport just outside Antrim. Well planned accommodation of approximately 3500sqft comprises; spacious entrance/ reception hall with oak spindled staircase leading to a feature glass gallery landing, sitting room with large bay, a truly unique dining room with curved glass wall and impressive vaulted ceiling, family room, contemporary oak fitted kitchen with concealed walk-in pantry and open to sun room with vaulted ceiling, downstairs bedroom with en-suite, rear hallway/ boot room, utility room, cloakroom, 4 first floor bedrooms (2 with feature balconies over-looking the gardens), 2 en-suite bedrooms and master bedroom with dressing room and family bathroom. Double integral garage with remote control operated door and games room over. Impressive high specification finish which includes; oak internal doors, skirting, architrave and staircase, feature glass first floor gallery, Oil fired Stanley range style cooker to kitchen, Walk-in shelved pantry in kitchen, a combination of solid oak flooring and natural stone tiled flooring to most rooms, high and vaulted ceilings to many rooms helping to create a fantastic feeling of space, builtin surround sound system to lounge, dining, kitchen and family room, sercurity system and built-in vacuum system. This home has been designed using many energy efficient technologies and boasts a high B82 energy efficiency rating. It boasts underfloor heating from a ground source heat pump, energy efficient high performance double glazing, pressurised water system, insulated concrete floors to both upstairs and downstairs and multi fuel stove to family room. Anyone viewing this home will fully appreciate these measures and this is an incredibly warm home. Outside this home has spacious grounds extending to approximately 1 acre in lawns. The home has been designed to capture the heat from rising and setting sun. Impressive high specification finish which includes; bespoke oak internal doors, skirting, architrave and staircase, feature glass first floor gallery, Oil fired Stanley range style cooker to kitchen, Walk-in shelved pantry in kitchen, a combination of solid oak flooring and natural stone tiled flooring to most rooms, high and vaulted ceilings to many rooms helping to create a fantastic feeling of space, built-in surround-sound system to lounge, dining, kitchen and family room, security system and built-in vacuum system. 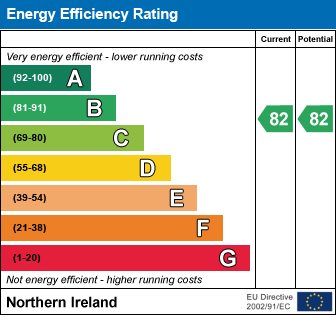 This home has been designed using many energy efficient technologies and boasts a high B82 energy efficiency rating. It boasts advanced insulation, underfloor heating from a ground source heat pump, energy efficient high performance double glazing, pressurised water system, insulated concrete floors to both upstairs and downstairs and multi fuel stove to family room. Anyone viewing this home will fully appreciate these measures and and benefit from the investments to experience an environmentally friendly and cost-effectively performing snug and spacious home. Spacious entrance/ reception hall Composite double glazed entrance door with double glazed feature light over, natural stone tiled floor, feature oak spindled staircase to first floor gallery landing which overlooks the entrance hall, recessed low voltage down-lights. Dining room 14' 9" x 15' 1" (4.50m x 4.60m) Solid oak strip flooring, feature curved glass wall which looks out on the reception hall, uPVC double glazed patio doors with feature fan-light over to gardens, impressive vaulted ceiling of 6.6m in height, double oak glazed doors to sitting room. Sitting room 19' 0" x 20' 4" (5.80m x 6.20m) Impressive sandstone fireplace with inset dog basket style grate with inset gas fire, solid oak strip flooring, feature square bay. Family room 14' 9" x 16' 1" (4.50m x 4.90m) Feature hole in wall fireplace with marble tiled surround and hearth, inset cast iron multi fuel stove, feature oak beam mantel. uPVC double glazed patio doors to garden. Solid oak strip flooring. Kitchen 16' 1" x 19' 8" (4.90m x 6.00m) A superb contemporary oak fitted kitchen with an excellent range of high and low level units, complimented by granite work surfaces & inset Belfast sink. Feature antique brick chimney breast with tiled splashback and inset oil fired "Stanley" range style cooker. Integrated dishwasher. American style fridge/ freezer. Coordinating centre island work station/ breakfast bar with granite work surface & inset sink unit with mixer taps. Amazing concealed walk-in pantry 1.7m x 2.1m in size - completely shelved with counter space and light. Natural stone flooring. Low voltage down-lights. Open to Sun room/ dining area. Sun room/ Dining area 13' 5" x 13' 1" (4.10m x 4.00m) Natural stone tiled floor. Vaulted ceiling 4.1m high. Glass ceiling to floor front window overlooking the front gardens and feature patio area. Downstairs Bedroom 5 16' 9" x 14' 5" (5.10m x 4.40m) Solid oak strip flooring. Square bay to front. En-suite Low flush wc. Vanity unit with inset wash hand basin. Fully tiled shower enclosure with sliding doors. Tiled floor. Low voltage down-lights. Hallway/ boot room uPVC double glazed external door. Natural stone tiled floor. Utility room 9' 6" x 6' 11" (2.90m x 2.10m) Excellent range of high and low level fitted units, part tiled walls, stainless steel extractor hood, 4 ring ceramic hob, built-in underoven, stainless steel sink unit with mixer taps, plumbed for automatic washing machine. Natural stone tiled floor. Cloakroom Low flush wc. Vanity unit with inset wash hand basin. Tiled floor. Low voltage down-lights. Integral double garage 21' 4" x 19' 0" (6.50m x 5.80m) 1 remote control operated garage doors. Range of fitted kitchen storage units. Staircase to upstairs Games room. Gallery landing Feature glass gallery over-looking the entrance hall and the dining room. Oak strip flooring. Walk-in hotpress. Master bedroom 14' 9" x 13' 1" (4.50m x 4.00m) Solid oak strip flooring. uPVC double glazed patio doors opening on to a feature balcony over-looking the gardens below. Dressing room Excellent range of fitted wardrobes and show shelving. Solid oak strip flooring. Access to roofspace storage. En-suite Luxury suite comprising; low flush wc, vanity unit with inset wash hand basin and bespoke black gloss seamless shower with pressurised overhead shower and glass sliding doors. Fully tiled walls and floor. Chrome heated towel rail. Low voltage down-lights. Bedroom 2 14'8" x 11'6" (4.50m x 3.50m) Oak strip flooring. uPVC double glazed patio doors on to a feature balcony over-looking the gardens to the front. En-suite Luxury suite comprising; low flush wc, feature unit with stone wash hand basin. Fully tiled shower enclosure with glass sliding doors. Fully tiled floor. Chrome heated towel rail. Low voltage down-lights. Bedroom 3 16' 5" x 10' 6" (5.00m x 3.20m) Oak strip flooring. Built-in bunk beds with slide. Bathroom 11' 10" x 10' 6" (3.60m x 3.20m) Luxury traditional style suite comprising; freestanding roll-top, clawfoot bath with chrome central mixer taps and shower attachment, high cistern wc, vanity unit with inset wash hand basin and large glass shower enclosure with pressurised overhead shower. Tiled floor. Recessed low voltage down-lights. Gardens and grounds Private stone tree-lined driveway off Irwinstown Lane with feature antique style street lighting leading to tarmac forecourt and car parking to the front of the house. Extensive gardens all around in lawn and extending to approximately 1 acre in size. Feature plants and shrubs. Cobbled pathway to the front. Raised patio / barbeque area to the front of the sun room which catches the afternoon and setting sun. Gardens to the rear with open countryside beyond and bordered by mature trees and hedging. Sunken trampoline. Feature brick paved patio and pathways designed to catch the morning and afternoon sunshine. Check out the property I found on PropertyPal.com: 2B Irwinstown Lane, Upper Ballinderry BT28 2HD.